Go Metro to CicLAvia: Culver City Meets Mar Vista + Palms! 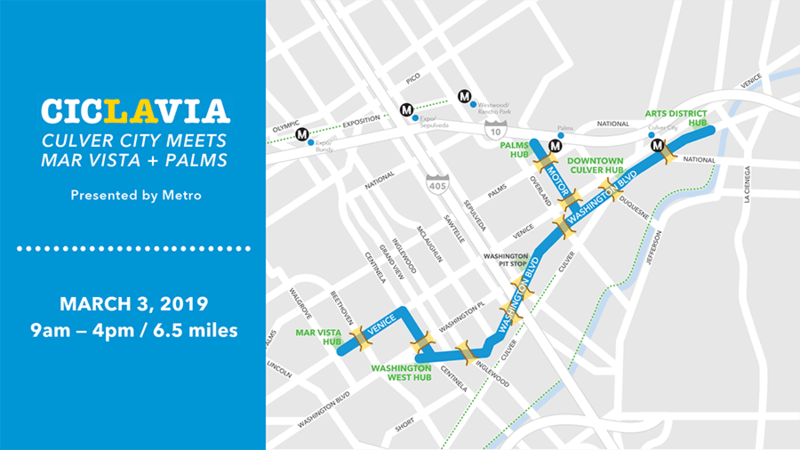 The first CicLAvia of 2019 is taking place this Sunday, March 3, with the route running between Culver City and Venice. Streets will be closed to cars and open for the enjoyment of cyclists, pedestrians, runners and skaters from 9 a.m. to 4 p.m.
You can reach the event via the Metro Expo Line. The stations closest to the route are Culver City Station and Palms Station. If you’re open to riding to the event, there is a bike path that parallels much of the Expo Line. The Ballona Creek Bike Path is another option — it connects Marina Del Rey to Culver City. If you don’t have a bike but want to ride, try Metro Bike Share. More than 60 new Smart Metro Bike stations will be available in Palms, Mar Visa, Playa Del Rey, Playa Vista, and in nearby Venice. Smart Metro Bikes and TAP cards will also be available on a first come, first served basis at information booths in Mar Vista, Palms, and at the Culver City Expo Line Station. Smart Metro Bike riders will be able to lock their bikes for free at Smart Metro Bike Stations on the Westside or, for a small convenience fee, at any public bike rack. Culver City Bus is offering free rides on CicLAvia Sunday to help people get to and from the event! And while you’re at CicLAvia, swing by Culver City Station to check out our newest Metro Bike Hub! The bike hub will be open for you to check out, and staff will be on hand to help with those who would like to register for access. For more information about detours on specific Metro Bus lines during the event, visit Metro’s Service Advisory page. For more information on routes and connections, use the Trip Planner or call 323.GO.METRO. CicLAvia is funded through the Metro Open Streets Grant Program, which provides funding to one-day events that temporarily close city streets to cars and open them to people walking, biking and rolling. The goal of the program is to offer people opportunities to walk and bike on city streets, or try transit (maybe for the first time) and foster civic engagement that supports walking, biking and skating projects and programs.